Nottingham: a city famous for its caves, its lace, its woodland-dwelling anti-establishment figures and its football teams. But to those in the know, the city is also famous for something else; its historic pubs. There is some debate as to which of Nottingham's drinking establishments is in fact the oldest. 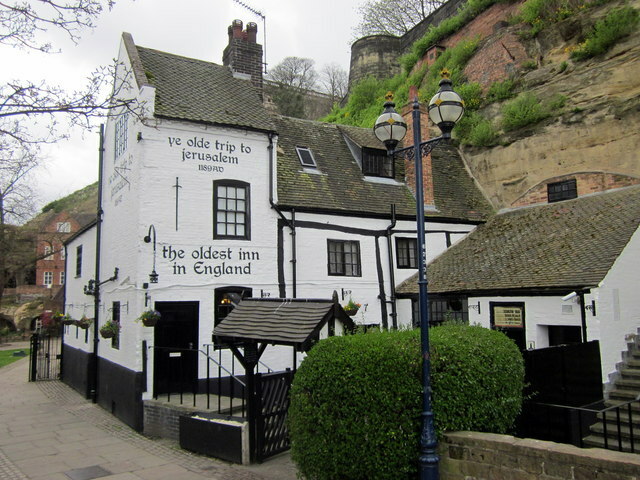 Ye Olde Trip to Jerusalem beneath Castle Rock probably holds the popular vote, but there are strong cases to be made for either the Salutation Inn or The Bell being the oldest pub, not only in Nottingham, but in the whole of the UK. One thing most agree on, however, is that the answer is not Oceana. Where better place to start than Market Square; the beating heart of the city? Stand on Angel Row and look eastwards you would be forgiven for getting all misty-eyed in response to the iconic majesty of the Council House. But tear your eyes away from this St Paul's of The Midlands and look to your right – this is the first stop on our journey. The Bell Inn's history stretches back to the 1420s when it was constructed to serve the monks of a nearby monastery. This age has been verified by dendrochronologists who tested the timbers here, and I don't know about you, but my mum always taught me to trust a dendrochronologist. The pub itself is a charming place made up of several snugs and a larger room and bar area in the back. If you get the chance, I recommend taking a guided tour down into the pub's cellars. These spaces were hand-hewn from the sandstone rock beneath the building and are fascinating relics of Nottingham's long history. Take a right out of the front door of The Bell and then take your second right onto Friar Lane. 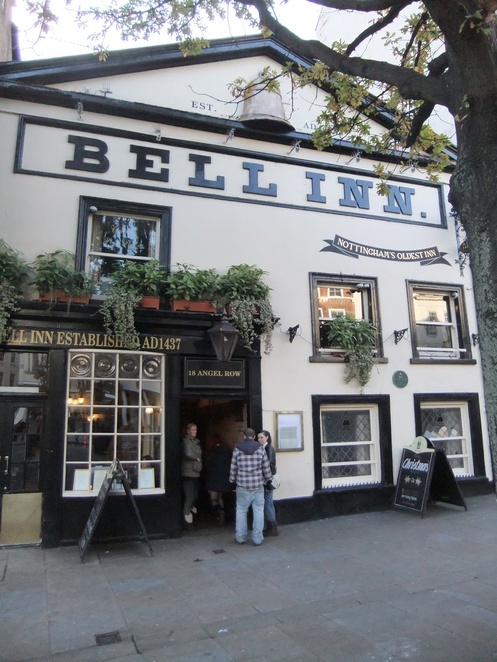 It's time for a short but worthwhile detour to a public house which – while unable to lay claim to being one of Nottingham's oldest – is still in possession of a fascinating history. 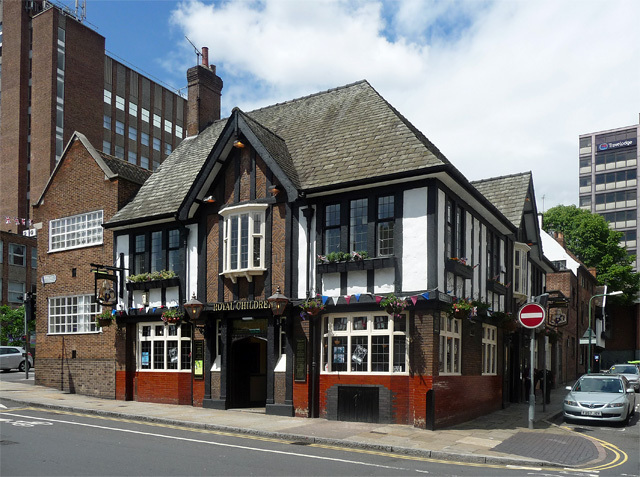 Turning left on to Spaniel Row and following the side street as far as Castle Gate will bring you to The Royal Children, a pub named after the blue-blooded offspring of Queen Anne and Prince George of Denmark. 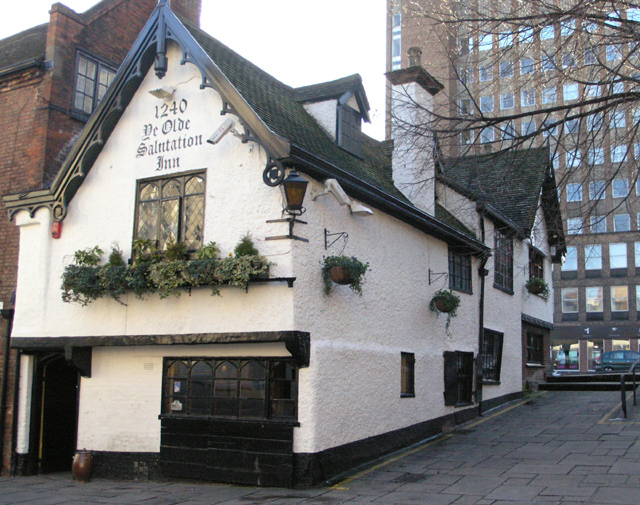 In 1688, as the forces of William of Orange were massing on the other side of the Channel, the young Princess Anne fled with her children to Nottingham, and took refuge in this inn near the castle. Local legend states that the spectres of the children still visit their former residence from time to time. A captivating building with a traditional timber frame in the Tudor style, The Royal Children is well worth a visit, not least for a pint of Harvest Pale from the local Castle Rock brewery. Just around the corner – or within staggering distance if you've imbibed more than a couple in each of the alehouses so far – is the Salutation Inn. Like most buildings in the city, the Salutation's cellars are found in subterranean caves beneath street level. Archaeologists have found evidence that the caves on these premises have been in use since the 9th century AD. Nowadays The Salutation is a rock pub, so if you like your beer accompanied by some rock and metal classics on the jukebox, this is your place. There is a wide selection of beers and other drinks to choose from and, as you may expect from a building as old as this one, stories of sightings of a ghostly patron in the form of a young girl named Rosie. Apparently Rosie can't get enough of this place, which is as good a recommendation as any! Now we're in the final furlong. Carefully cross Maid Marian Way and follow the tourist trail round to the castle. Pause to take it all in, then head down Standard Hill to the last location on our whistle-stop tour of Nottingham's oldest drinking establishments: Ye Olde Trip to Jerusalem. If you hadn't noticed already, Nottingham has a fair few caves, and a significant proportion of Ye Olde Trip is dug from the very rock upon which the castle sits. This gives the place a unique atmosphere which is both snug and pleasingly spooky at the same time. While the building itself is much younger, the inn is said to have been established as far back as 1189 when it was stop for crusaders on their way to the Holy Land. In that time, Ye Olde Trip has developed a reputation for the supernatural, and several parts of the inn are said to be haunted, cursed, blessed, or all three! You will probably notice the creepy-looking model galleon which now sits in glass case. This is the pub's infamous cursed galleon which is said to claim the lives of anyone who attempts to clean it. Leave it well alone and enjoy your pint of Olde Trip in this most unique of settings. So, where to next? Oceana it is.